This week we are turning our attention to a machine often spoke of in the same breath as words such as art, skill and technique honed over time. 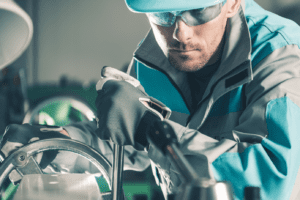 For those very reasons outsourcing such work can be incredibly expensive, so getting it done in-house, and gaining those skills with a solid, reliable machine is a very good policy. We are of course talking about section rollers. Section rolling isn’t such a dark art though as the tutorial over on our YouTube channel will no doubt demonstrate. Technique is important however, particularly when you consider that some jobs, particularly those involving the shaping of gates or railings can often be ornate, even artistic. At Selmach we offer operational training on section rollers, as well as all the other machinery we sell, but it is important to remember that section rolling also sometimes goes hand in hand with creativity and skill, as well as operational know-how. This is the reason why a lot of companies outsource their work, and why they are often forced to pay a premium price to do so. But again, sometimes it is not the cost of subbing the work out, it is the hassle involved in having to send the material away, join a waiting list and receive the rolled material when it can be completed. Also another factor is the cost of transport of outsourcing, this alone can sometimes be more than the rolling cost itself. 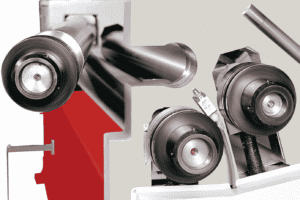 At Selmach, we offer an impressive range of section ring rollers encompassing both manual and hydraulic models. One of our most sought-after models is the Morgan Rushworth PSR50, a smaller manual model with 50mm diameter shafts. It comes with a full set of rolls for the bending of flat bar, flat bar on edge, round bar, square bar and box sections. Its cost-effectiveness, versatility and good capacity on larger materials, combined with the reliability of the Morgan Rushworth brand make it a well balanced and consistently popular choice for our customers, it is a machine we looked at in action this week and its ease of use and sheer versatility were evident. As well as NC control there are also a range tube rolls available for the section roller, allowing the operator to work with tubing, ensuring the tube rolls match the size of the material to prevent damage during the bending process. A common misconception we come across is what exactly a section roller can do compared to a dedicated tube bender; a moving section roll produces an arched curve as opposed to the tighter elbow bend or 90° angle of a tube bender which it can deliver due to its fixed position. 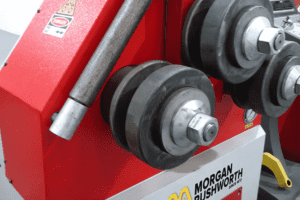 The Morgan Rushworth range of manual and hydraulic section rollers represents a genuine cost effective solution to expensive outsourcing. 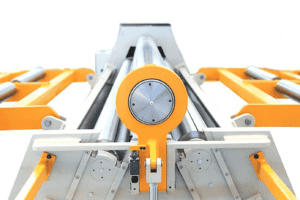 With optional tube rolls, spiral bending and NC/CNC control, section rolling doesn’t have to be such a specialised task, it could instead be done by you or your team.